For the past two weeks, Brazilians have taken to the streets to protest against issues that may seem surprising to the rest of the world. Brazil is the sixth world economy, an emerging and powerful nation; when Brazilians occupy the streets, it is usually for Carnival or to celebrate a football victory. But the hundreds of thousands of protesters on the streets of more than 25 cities are not celebrating – they’re angrily calling for urgent reforms. And their movement, if it can be called that, has ignited the passions of their compatriots who otherwise would have been among the silent majority. Espedita da Costa, an 84-year-old woman was standing beside her grandchildren on Avenida Paulista, the most prominent avenue in São Paulo, holding a sign calling for reform. “I’m here because I think it’s necessary to always fight. Years go by, but you need to keep the fight. I feel good by fighting not for myself, but rather for my grandchildren, all of you deserve a better country, with much better public services,” she told The BRICS Post. The protests have been so animated, sudden, yet persistent that President Dilma Rousseff had to set an emergency cabinet meeting to discuss the growing public unrest, the largest in more than two decades. In a televised address on June 21, Rousseff appeared to cave in to public demands that she cancel an official visit to Japan. “Brazilians have brought important lessons to the streets, the fares have been revoked and now you know that your concerns have gained national priority,” she said. Rousseff also highlighted the importance of profiting from the strength and essence of peaceful protests and condemned violent acts. The President also announced some immediate measures such as meeting all the governors and mayors to form a pact regarding the improvement of all public services. She also said that she would direct 100 per cent of petrol royalties to education. Her final appeal was that Brazilians gather as one and embrace next year’s World Cup. Reaction on social media was immediate, with people stating how “predictable” the speech was and how Rousseff seemed more concerned in “pleasing FIFA” than her own people. The only thing that surprised some was the petrol royalties’ proposal for education. Roussef’s speech may on the surface appear to be predictable and perhaps a week too late, but it remains to be seen whether the momentum will remain with the protesters. The initial demonstrations in São Paulo against bus fare hikes have met with success, despite the clashes between police and protesters. But these protests inspired demonstrations in other major cities across the country. Suddenly, Brazil was protesting on a massive scale and it seemed the end wouldn’t come for some time. On Wednesday June 19, both Rio de Janeiro and São Paulo announced they would rescind the bus fare hike, the main demand behind the protests. A total of 11 cities so far have done the same, but the protests just keep on growing and getting more violent, spreading to smaller cities, in the interior states. In Ribeirão Preto, a city a few hours away from São Paulo, an 18-year-old attending a rally was hit by a car and died. On June 20, the protests peaked with around one million people taking to the streets across 25 state capitals and a total of 90 cities. In the capital Brasilia, around 30,000 people reportedly tried to invade Palácio do Itamaraty, the Brazilian Foreign Affairs Ministry building. In at least 13 cities, there have been reports of violence and clashes with the police, with dozens injured, including journalists. The kickoff of the Confederations Cup – FIFA’s tournament just one year away from the actual World Cup – has definitely centered the international media on Brazil, only this time not for football reasons. Last weekend in Brasilia, while Brazil was about to defeat Japan in the kick-off match of the tournament, thousands were protesting outside the stadium and being teargased by the police. Some international media were already covering the demonstrations, but as Brazil’s demonstrations became more massive, so did the media exposure – Brazil became the international story of the hour, making headlines all over the world. The protests also captured the attention of demonstrators in Turkey, who sent signs of solidarity in Portuguese – “Everywhere is São Paulo”. Brazilians reacted by hoisting Turkish flags in the streets of São Paulo and carrying signs saying “Turkey is here”. From Brazil to Turkey, a global movement of discontent appears to be emerging and just like Taksim Square in Istanbul, the protests have gone beyond the demand for a green park, or calling for rescinding a bus fare hike. The protesters appear to have seized the momentum and called for social justice, education, health and better living conditions in general. The Confederations Cup and the proximity of the World Cup exacerbated all the frustrations about inequality, public expenditure and corrupt politics many Brazilians have been keeping to themselves. Francisco Albuquerque, a 32-year-old radio professional, told The BRICS POST that he was against the World Cup because of how much was spent to host the event in Brazil. “All the money spent in the World Cup should have been used in order to improve the country, in terms of health and education, not stadiums,” he said. He hopes the protests will change the way the country is perceived abroad. “I think Brazil is always linked to football and this alienates people sometimes. Carnival and football are good, but it’s also good that the international community acknowledges that Brazil is much more than that, that we fight for our rights and that a lot more is at stake here,” he said. Since its beginning, the protest movement has been shaped by young people, mainly students. The organizers of the protests, the MPL – Movimento Passe Livre (Free Fare Movement), say they stand for the right to free public transportation. It is a popular movement, linked to no party, something they have been very clear about in their claims. However, lately they have felt the need to differentiate between a non-partisan and an anti-partisan movement. “MPL is a social non-partisan movement, but it is not anti-partisan. We condemn all violence acts directed at political parties during today’s [Thursday night] demonstration, the same way we have condemned police violence,” they stated in an official statement on June 20. In São Paulo, some among the protesters have started to feel uneasy about the lack of party affiliations in the demonstrations. One sign on yesterday’s protest read “My party is my country”. Some protesters on site showed concerns over this anti-political and anti-party discourse. For Talita Saito, a 21-year-old law student, this may show some hidden agenda. 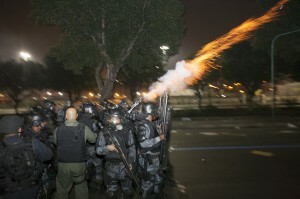 Some cases of violence between protesters were reported, with party’s flags being burned by people whose only flag was green and yellow, Brazil’s national colours. Diego Medina, a 27-year-old lawyer, believes some protesters lack political maturity. “We live in a democratic country, so I think parties have the right to attend the rallies. I have no party, but they do have that right. I think these people are not expressing themselves in the best way; it lacks discussion about what it is to have a political identity and to share the same democratic space. Otherwise people will just fight for no reason as we’ve seen today in isolated cases,” Medina said. In the meantime, as the demonstrators weigh the impact of the political – or apolitical – framework to their protests, the Confederations Cup keeps on rolling in the stadiums. The final match is scheduled for June 30.